If I could inspire a movement, it would be one that is based on twos word…….unbridled love and compassion. No-one has the right to demonize anyone for the sake of promoting their own point of view. We have to learn as a world culture to understand that violence is never appropriate and in the end, love is still the strongest force in the universe for doing good. It’s never a matter of converting people to your view so you feel better. It’s a matter of loving them no matter where they are at or who they are. It’s probably the hardest discipline you can ever undertake in your life….but it will transform others….and most of all you. As a part of my series on how influential people built empires from nothing, I had the pleasure to interview Craig Wolfe, the creator and founder of CelebriDucks. 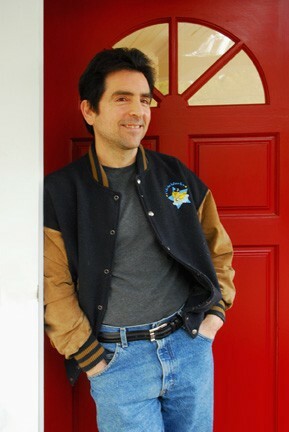 Craig became the largest publisher of artwork from television commercials creating the first ever animation art lines for Coca-Cola, Anheuser-Busch, M&M/Mars, etc. Eventually he sold it all off to create CelebriDucks which was a whole new art form of celebrity rubber ducks of the greatest icons of film, music history, and athletics. They were voted one of the top 100 gifts by Entertainment Weekly and featured on hundreds of TV shows, magazines, and newspapers including The Tonight Show. He has since sold millions of them and his company is now considered the top custom duck manufacturer in the world doing them from everyone from SeaWorld to The New York Yankees. He also addressed the importance of bringing jobs and industries back to America by bringing the whole rubber duck industry back to the USA where the rubber duck was actually invented before the whole industry went overseas. His company is now the only ones making them in the USA and he is doing them for companies and organizations such as Harley-Davidson and The Future Farmers of America. His second US factory in Michigan is now making PVC Free rubber ducks out of food and medical grade materials which are considered the safest rubber ducks in the world for babies to teethe on. Well, let me give you a bit more info right from the very beginning of all of this. To be very honest, I was stagnating working as a retail credit card collection clerk at Crocker Bank in San Francisco. It was my first really big job in the 70’s. It was the most mind-numbing work you can imagine in the most boring atmosphere imaginable. Needless to say, I did not enjoy it at all. Stagnate and you will only grow old more quickly, I always say. I was going absolutely nowhere, but I really didn’t have a whole lot of business skills and had no idea what to do with my life. So I took the paycheck and committed myself to a most boring and uninspiring daily existence. It all seemed pointless, but what other options did I have?? That being said, one day I saw some animation art of Mickey Mouse hanging on the wall of a store and decided that there is no use staying in a job you hate. Better to follow your passion and do what you love. Thus I quite that bank job and started buying and selling original Disney animation drawings from the 1930s. I loved it…..finally felt inspired by something in business!….. and over time I became the largest publisher of artwork from television commercials in the country creating the first ever animation art lines for Coca-Cola, Anheuser-Bush, M&M/Mars, etc. That being said, I think that it is very healthy and necessary to always evaluate your quality of life, even if you are making good money. Thus as much as I actually did enjoy my animation business, I still wanted to do more. 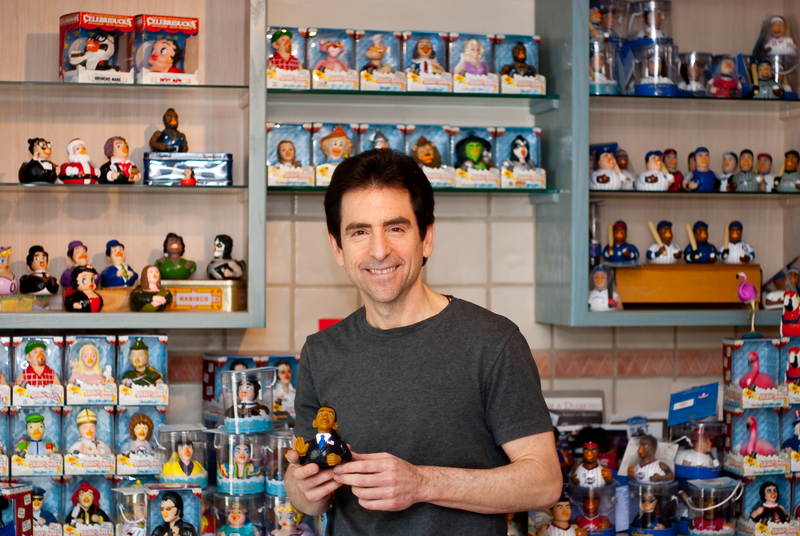 Thus I sold it off to create a very unique company, CelebriDucks, which is a whole line of celebrity rubber ducks of the greatest icons of film, music, history, and sports. No-one did licensed rubber ducks as the intricacy in the sculpting and painting I wanted to do was unheard of. We ended up selling millions of ducks and creating a whole new company that does a line of celebrity rubber ducks that were voted one of the top 100 gifts by Entertainment Weekly and featured on hundreds of TV shows, magazines, and newspapers including The Tonight Show. In fact we are now considered the top custom duck manufacturer in the world. Well, no-one could grasp the concept so it was hard getting licenses in the early days. There was just no precedent for it. It seemed that at best it was just going to be a little side business. I mean I did not have the resources to compete with the likes of the big toy companies. But I just keep feeling inside me that this was a great idea that just needed time to get out there. So I just kept sending out press releases one by one to papers all over the country. I bought those big books of all the different media outlets and mailed out the press releases myself. One day I got a call from a reporter at The Atlantic City Press. She said she got my press release and wanted to know why she should write about us. I thought about it for a moment and then told her that since I’m actually from New Jersey and used to go to Atlantic City all the time, why not? So she says, “Ok”. The story appeared that weekend and the VP of the Philadelphia 76ers who lived in New Jersey happened to read it. He called me immediately and then flew out here to meet as he wanted us to do an Allen Iverson duck for a NBA promotion. He was their top superstar. It was a huge hit! Then the Chicago Cubs, the Yankees, etc. all called and wanted to do promotions. We were all over ESPN and in the national media and before long I sold off the animation business and became all ducks…who knew! I would say that I never lost sight of the vision that I was doing something that had never been done before so it was not going to become part of the culture overnight. And I also had this deep feeling that I could do something with this company that could really make a difference in the lives of people here. So without a doubt, the most difficult thing I ever attempted was when I wanted to bring part of our manufacturing back to America. You always have to find a way to inject passion into what you do as you create your legacy. And so in my late 50’s I also wanted to do something right and make some kind of difference in the lives of people here in America. I got so tired of seeing the loss of jobs and industries in America and everything being outsourced. It was very sad to see so many Americans losing their jobs. I saw companies unwilling to take the risk of bringing their manufacturing back here. For me, it was very important to bring a whole industry back to America. Thus, I finally decided that I had to do something. I really had no idea how to do it here, but I just assumed that I would figure it out. The rubber duck was actually invented in the USA. Now every rubber duck was being made overseas. We decided to bring the whole rubber duck industry back here and are now the only ones making them in America once again! You often hear about industry returning to America. I really want to make something clear about this. You might see bigger molded plastic parts and such coming back here and more robotics and so forth, but the small hand-painted toy industry which also uses rotational molding is virtually gone and is NOT easily coming back at all. It is just too much hand work to do the painting of small toy like items plus with all the EPA regulations, most of the rotational molders could not survive. In the Made in America section on our website you can read more about our story. I knew from the start that it would be a very expensive and big risk. But I never knew just how much the technical skills had been lost here and how much work it would take to get it all re-established. Honestly, it was a disaster which is why I first called it a failure. No-one could make them correctly and we were getting our asses kicked. It seemed like a tremendous mistake. I was on the verge of losing so much money plus missing deadlines with our custom work that was unheard of for us….unbelievably stressful!!! A friend called me who knew what I was going through and suggested that I work with a whole other cast of characters that I was unaware of. I got in touch and made the decision to move my entire US production from Ohio to New York. I had to remake all my molds and start from scratch with brand new people. It was not for the faint of heart, I can tell you that. But I felt I had no option so I rolled the dice and never looked back. I always joked that if I didn’t own the company 100% I would have been fired. There was no way I was “maximizing shareholder value” in the short run. But I knew in the long run, it should put us in deadlines and do smaller production runs that our competition cannot. And the quality and safety of our items is as good as it gets. Truth is that we are now in a fabulous position as we own our niche. No-one else will ever try doing what we did and making rubber ducks in America…trust me! In terms of other benefits, we now have companies from Harley-Davidson to The Future Farmers of America wanting us to make ducks made for them in America and we are getting national PR which has been wonderful for the company. It has been very emotionally rewarding doing this and they are now some of our most successful products. In fact a few years ago a national TV show just shot an episode of how a rubber duck is made at our factory which will aired all over North America and Europe! You can watch a clip of it at the top of the Made in America section on our website. So yes, without a doubt this US venture was the most stressful and financially difficult venture I have ever taken on in my life. That being said, sometimes you just have to do what is right and look at a bigger picture. We chose to embrace change and never look back…..and fortunately it worked. 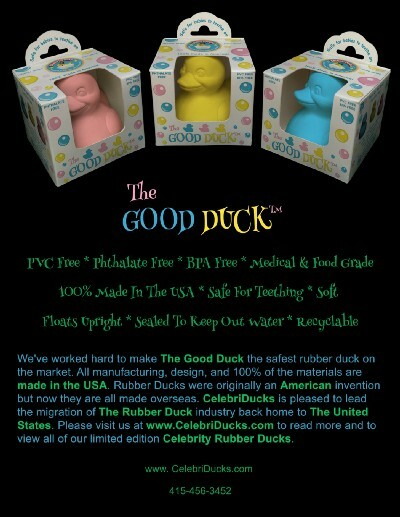 In fact at our new factory outside Detroit we are making The Good Ducks, the only duck on the market that is 100% made in the USA and PVC, Phthalate, and BPA free using medical grade materials and are considered the safest rubber ducks in the world for babies to teethe on. Bottom line, I am now doing things in America that even Asia cannot duplicate. It really is an amazing story. Out of the embers of one’s failures can come amazing things…..
1 It’s not how much money you make, it’s how much you keep. Excessive overhead can bring down any business no matter how much you make. Lean and mean is the key to survival especially in the beginning before business gains traction. You know I started this business out of a home office and still work from home. I am outsourced all over the world. It’s a great equalizer giving every small business the chance to compete with the big boys. Working like this allows you take big risks and swing or the fences and if you miss, it’s not going to bring you down as you have a much lower overhead to support. 2 Do not try and be all things to all people or you become nothing to anyone……focus like a laser on your niche and be really clear on what you stand for. Just look at the car market today. Remember those old classic cars that had so much character. Now it almost seems that most cars from most companies looks so similar that they have lost their distinct personalities and in doing so have undermined their brand equity in the process. 3 Reflect your core brand ethics and quality in every marketing communication to the public. Never deviate from who you are. I was watching an episode of Behind the Tank and Robert Herjavek was addressing his Tipsy Elf company who were making high end sweaters that were doing well and now they wanted to capture a bigger share of the market and release a cheaper line. Robert knew it was the kiss of death. Because they were destroying their brand equity of these high quality very cool and fun sweaters. You cannot be in the middle and try to please everyone. No-one ever has and no-one ever will! 4 Compete on the cheap end and someone can always make it for less…..Quality like the tortoise will ultimately win out or as I lie to say, “live by the penny, die by the penny….don’t compete on price alone! Quality is the hardest thing to knock off. 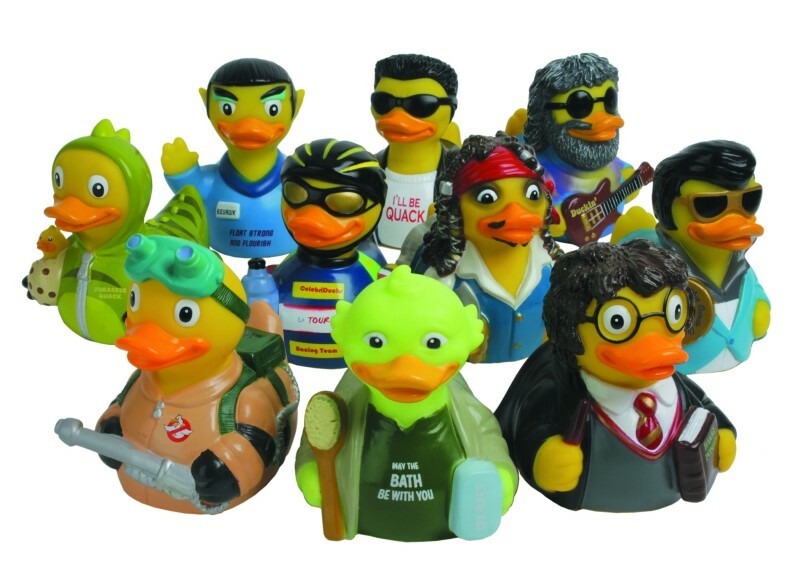 There were a ton of rubber duck companies out there when I began. I knew how I could carve out my own niche. They will always make something cheaper in China, but never spend the money to go upscale. Thus I spent the money to make the most intricately sculpted and painted rubber ducks in the world and even put them in their own individually designed gift boxes! And twenty years later, no-one has even attempted to create a line like ours. A lady came to us from Australia wanting us to create ducks for the Australian Rugby Union. To make a long story short, we ended up taking too small a deposit plus allowing her to visit our factory overseas. Big mistake. She was effectively trying to go behind our back and damage our relationships overseas. Plus she pulled a blackmail stunt in that if we didn’t release the goods, she was not going to pay for them. It was very dramatic and quite a story. It was a potential loss of tens of thousands of dollars with the potential to really hurt our business long term as we knew we could no longer work with our current factory!! I really should have trusted my gut instincts and never let her get in touch with our people over there. Can you imagine losing your whole factory….everyone you depend on! And they had the molds for our entire line of ducks!! But in the end I learned a lot of good lessons and in fact it turned out to be a real positive as we ended up working with a new and better factory that had the capability to take our business to a whole other level. What I’ve come to learn is that every misfortune or difficult moment is nothing more than another moment ripe with potential and I realized that something good can always come out of it. I don’t know why they don’t teach that in business school because to me it is at the heart of every successful business venture that had to overcome adversity. That mind-set is so so important to overcome business failures which will always occur in some way, shape, or form. So not only did we survive, but it turned out to be something positive in the end. Sure we lost money in the transition…but over time made it all back and a lot more. Well, they do say that behind every great man is a great woman. I would not call me a great man but I would call my lady friend a great lady. When I was going through that whole drama with my factory overseas and that lady from Australia and pretty much freaking out feeling so crushed, it was she who reminded me that we are never trapped and to believe that is crippling. She reminded me that everyone always has a choice. And once I realized that I knew what to do. I should also mention that our top selling new Celebrity Parody Costume Quacker line was her idea! Money is only as good as what you can do with it. All the money from this business is currently being left to non-profit charities that serve the elderly, the ill, the poor, those who are so in need of help, but have so little access to the help they need. I love the new projects I am working on. We are working on a children’s book to go along with our Spooning Chocolate company about a duck, Cocoa Canard, who goes through a journey to lead him to a deeper understanding about love and happiness. It’s basically the nurturing children’s book that I so wish I had as child. I am very excited about this book and am also working on an album with music that I likewise hope will be inspiring to people of all ages. To me your employees are your family. You know, bottom line for me in terms of creating a more enjoyable business atmosphere for me and everyone else, it really is based on what I would call more of a compassionate view of how to do business. When you naturally look at people not as commodities to make you more money or make your life easier, but as real human beings with feelings, family, needs and desires, and only wanting to be happy, that really does change how you relate to them and any issues that arise. I know it’s probably not something taught in business schools, but the core of running a successful business is compassion for others. When compassion leaves, the heart of a company is lost. And more than that, having a happy, supported, and effective work force who will strive to go the extra mile for everyone’s benefit is likewise lost. Business for me was never about just making money. It was about doing what I love and trying to make a difference in the world with my business and my money. Frankly, I’m surprised at the money I did end up making. But I honestly feel with every fiber of my being that having a compassionate, and yes, even a loving attitude with your employees…all of them, is the way to run a business….a life actually. Taking time to break away from all the social media, endless meetings, and connect personally and emotionally with your employees becomes not only good business that benefits you personally, other people, and the company itself, but it’s a way of doing good that makes everyone happier. It helps people to change since it is done in an environment of love as opposed to fear. I know it does not sound like formal business advice you can read in business books, but to me, it is the heart of not only what makes a business effective, but one in which you want to be involved in every day. What’s that worth…priceless. I love this quote….because it never ceases to remind me that it is not about your present failure or your present success as you will constantly have both in life. The key is your point of view, your heart, your fortitude in the midst of whatever is happening. The pendulum will always change. Your heart and capacity to love is the one constant you can always resort to.